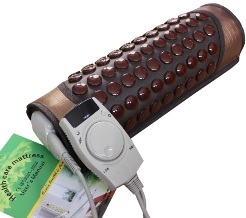 The InfraMat Pro Pillow by Healthy Line is a heat therapy healing pillow made using some of the highest-quality tourmaline stones available. The professionals at Healthy Line put the tourmaline stones through a process that enhances and brings out their healing properties. When ground, crushed, and molded into stone tiles, the negative ion content contained naturally within the mineral increases by 15 percent. This special process enriches the negative ion content of each tourmaline stone to more than 1,500. Tourmaline helps detoxify and cleanse your body, increase blood circulation, and stimulate fat loss. Modern health care professionals praise tourmaline’s profound ability to provide relief from and prevent illness, including its ability to reduce the symptoms of psychiatric symptoms, such as depression and anxiety. Healthy Line’s InfraMat Pro Pillow uses tourmaline’s unique composition to give your mind, body, and spirit the healing it needs. Unlike other heating pads on the market, Healthy Line’s products seep through two to three inches below the skin, giving you a deep penetrating heat therapy that mends the body from the inside out. • Adjustable LED display controller for you to set the temperature of the mat to your liking; find your optimal comfort level by using a few simple buttons! • Heat from Far-Infrared (FIR) rays penetrates deep below the skin and boosts the immune system, relieves stress and pain, and stimulates blood circulation. Infrared rays, unlike ultraviolet rays, are completely harmless to the skin and can even help treat the symptoms of certain skin disorders. The U.S. Food and Drug Administration (FDA) has studied the radiant far-infrared heating system and confirmed its ability to improve health and stimulate feelings of wellness. • High-level output of negative ions (1,500 on tourmaline mats), which help strengthen your body’s autonomic nervous system, build up the immune system, speed up your metabolism, and protect against environmental stressors. The negative ions in Healthy Line’s heat therapy pads are completely harmless and occur naturally in such places as mountain springs and waterfalls. Negative ion therapy causes biochemical reactions within our bodies that physically reprogram them to become much stronger and healthier. • High-quality tourmaline stones used for maximum efficacy in promoting physical health, mental health, and beautification. Tourmaline is typically mined locally in small villages in China, and studies have found that residents of those villages tend to be healthier and have longer life spans than residents elsewhere. It has been considered a precious mineral for centuries and is used and studied today by health care experts to alleviate pain and ailments and improve overall health. Made with materials of the highest quality and optimized for your safety and well-being, InfraMat Pro Pillow by Healthy Line can improve your health dramatically. So do your body a favor and get one (and maybe even an extra one) now!